Our Annual Parish Meeting will be held on Sunday, February 12th. Anybody who considers this parish home and who has attended regularly for some time but has not yet become a member is encouraged to do so before the meeting. Please contact Dn. Nicholas for a membership form. As you know, our deck has been completed, and is a wonderful addition to our facility. We need to complete the work by cleaning and sealing the deck as soon as possible. Please contact Fr. Seraphim or Dn. Nicholas if you can help with this work. Our parish has a brotherhood, named in honor of St. John of San Francisco. It's mission is one of both service and fellowship, and one of its roles is to help with tasks that need to be done around our building and grounds. So far our membership is very small, however. If you are interested in joining the brotherhood, please contact Dn. Nicholas. This week, we collected $72 for the pressing needs of Holy Cross Monastery. Next week's collection will be St. George's Food Pantry. On Wednesday and Friday, we fast as usual. Zacchaeus teaches us the process of repentance. We are already past Theophany and preparing to enter Great Lent! 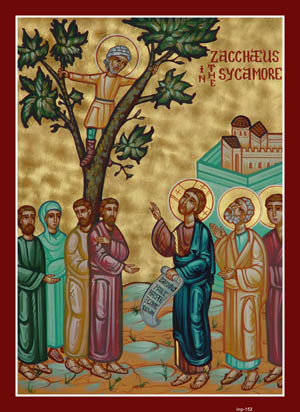 Synopsis: The Story of the repentance of Zacchaeus, the "chief among the publicans" marks the beginning of the preparation period for Great Lent, which in turn prepares us for Pascha. We look at this story in the larger context of what we should be doing in Great Lent. It is *not* just about fasting and repentance! It is more about opening ourselves to the grace of God to be changed and healed. This is what happened to Zacchaeus, and we look into our Lord's dealings with him and his response in detail, with the aim that both would teach us how to live in a way that makes us more able to receive the grace of God and change, and be truly happy. uke 19:1-10 1 And Jesus entered and passed through Jericho. 2 And, behold, there was a man named Zacchaeus, which was the chief among the publicans, and he was rich. 3 And he sought to see Jesus who he was; and could not for the press, because he was little of stature. 4 And he ran before, and climbed up into a sycomore tree to see him: for he was to pass that way. 5 And when Jesus came to the place, he looked up, and saw him, and said unto him, Zacchaeus, make haste, and come down; for to day I must abide at thy house. 6 And he made haste, and came down, and received him joyfully. 7 And when they saw it, they all murmured, saying, That he was gone to be guest with a man that is a sinner. 8 And Zacchaeus stood, and said unto the Lord: Behold, Lord, the half of my goods I give to the poor; and if I have taken any thing from any man by false accusation, I restore him fourfold. 9 And Jesus said unto him, This day is salvation come to this house, forsomuch as he also is a son of Abraham. 10 For the Son of man is come to seek and to save that which was lost. Happiness (Salvation) is having our outside match our inside. I love to come up with little aphorisms, and collect others I hear and read. My little sayings come out of two main sources: my overall life experience as a flawed human striving for perfection, and as a pastor, trying to guide flawed humans to perfection. Basically everything I say pastorally is in order to pursue perfection, which the scripture understands as absolute completeness, without anything lacking, and holiness, without anything added. Our major problem in life is how we think about things. When we think wrong, we do stuff that is wrong, whether the wrong remains privately within ourselves, in our thoughts, or is expressed in our actions and attitudes. Wrong thinking ALWAYS (ALWAYS, ALWAYS!) leads to disturbances within us, and destroys our inner peace. We think wrongly, but hide it maybe 99% of the time, but the thoughts, attitudes and bad priorities have their effects on us. I think all soul destroying unhappiness is because of our wrong desires, which we either suppress with effort (and therefore turn the unhappiness into joy (over time! It is a process! ), or give into outright (delaying and increasing unhappiness), or tepidly resist, causing us to be in a state where we are “neither fish nor fowl” – perhaps not appearing to do wrong, but inside a battle rages and tires us. Salvation: When our outsides match our insides. Here is another definition of salvation: When our outsides match our insides. This is the state of perfection, when we do not need to fake anybody (or ourselves) out – we love the Lord’s commandments, and the prophesy is fulfilled in us: “My yoke is easy and my burden is light”. When our outsides match our insides, there is no internal war within us, but instead, great peace, and holiness. We must understand a little bit about evil to understand the aphorism. It is never possible, even for a very evil person, for their outsides to match their insides. They may never consciously have a Godly thought or action, but they remain a creature made in God’s image, and the voice of God will always be calling to them, leaving them without peace. The only way for our inner disposition and our outer life and deeds to match is for us to hear and obey the voice of God calling us to holiness. We have an epidemic of depression, anxiety, addiction, other mental illnesses, sexual promiscuity and perversity, and many other soul destroying and strength sapping practices, and all of these things are a way in which the outward man is not matching who the inward man should be. The mortal part of human life (our life here and now, on the earth) is a battle to have our outsides match our insides. The battle is long and bloody, but it is the only way to perfect peace. As we fight this long war with many skirmishes, we will have many moments when our insides tell us one thing, but our outside does not reflect this. If this is because of our inner battle to “do good and avoid evil”, this skirmish strengthens us, even if it appears to us to sap our strength. Here are some real world examples, gleaned from my experience as a confessor, and a flawed human. Making our insides match our outsides – real world examples. Somebody cuts us off in traffic. Inside, we have the thought to curse then, and perhaps we even “hear” the words, or to flash our lights, give them the finger, etc, BUT WE DO NOT DO IT! A great victory has been won, and over time, the insides WILL match our outsides – we will not have that flash of profane anger. We see a sexually suggestive picture or provocatively dressed person, and we want to look more, and have a feeling that “just does not feel right” inside us, but, with effort, and maybe even with a delay, we look away, and utter the Jesus prayer: “Lord Jesus Christ, have mercy on me”. We did not come through the skirmish completely unscathed, but we have won the victory nonetheless. In time, we will be like the old man who could converse with the prostitute without any lust, (while his disciple, who was not as far along in the road to perfection, quite appropriately covered his head in his cowl, to avoid looking at her). Someday I will tell you that story – it is one of my absolute favorite ones from the monastic fathers (I do not know where it is, if one of the readers of this essay does know, please contact me). We DO NOT LIKE somebody in our office, school, gym, family, etc. There may be good reasons for this, but whenever we see this person, there is a darkening in our soul, and we feel the cold fingers of anger, or disgust, or any of dozens of judgmental thoughts and feelings. We want to avoid even seeing them, much less speaking to them (especially if unpleasantness usually develops), but we master ourselves and say “Good morning”, or “I am about to get a cup of coffee, would you like one”, or something else that we do not feel inside (but we know we should). This is not in ANY WAY hypocrisy! We are ordered to be kind to one another. It is bad if we are not kind “inside”, but we doubly sin if we show this unkindness outside too. Another way to fight with these inside feelings is to do one thing every day, and not do another, ever. The thing we must do even if we do not feel good about this person “inside”, is to pray for them EVERY DAY, even if it is through gritted teeth. Keep it simple, and short. God knows what they need, and He does not need to be reminded of their faults. Write their name down, and every day, say “Lord Jesus Christ, have mercy on (name)”. Ignore the thoughts that arise up within you. We are trying to be like the second son, here – the one who initially did not want to do the will of his father, but eventually did so. We are like this son if our thoughts are bad, but our actions are good. What did God say about this son? He was the one who did the will of his Father, and over time, we will hear this too. The thing we MUST NOT do is slander this person, or gossip about them. If you do this, discipline yourself by praying for them even more – instead of one little Jesus prayer, say 10 or a full prayer rope for them. You try this, and see if your feelings about a person do not moderate and you gain some peace regarding them. Here is another example that I will speak about obliquely, since I do not know who will read this essay. If a person has a problem with impurity, especially with themselves alone, but perhaps because of fornication of any kind, and they feel bad about it, it is a bad thing to just sit there and feel terrible about what you did, again. Our reaction to sin can be more debilitating than the sin itself. Every time you fall into sin, PUSH against it. We have an excellent little book called “The Prayers for Purity”. It is long, and not too easy, but then, getting rid of habitual sin, when our insides want to follow God’s perfect law, and our outside often do something else, is NOT EASY either. Note to self: order more of these books. The Scripture tells us that “All men are liars”, and this is in large part because we hide within ourselves thoughts, desires, attitudes and priorities which are not in keeping with who we say we are and the person we present to the world. May God help us to be “truth tellers”, that is, to have our insides match our outsides. Amen. Yes, you read it correctly. I state categorically that depression and anxiety are mental illnesses. We are all on a continuum of mental health, and EVERYTHING that is not according to the will of God is a mental illness, according to the Christian understanding of the term. Lust, jealousy , anger, laziness, aimlessness, not having meaning in life, and about a billion more things that are part of our fallen lives are all illnesses of the mind. ?Here, I am not speaking about the brain, but the “nous”, which is the reasoning part of the soul. When our nous is completely in concord with the will of God, we will have ZERO mental illness. Matthew 21.28-32 (read 10th Wed after Pentecost). Only in Matthew. Amazingly, even though I have mentioned this parable a zillion times in homilies, I have no homily of mine that I can refer you to that is about this passage. Psalm 116:11 Brenton “I said in my amazement: Every man is a liar.”. This Psalm is said in the Preparation prayers for Holy Communion. This week, we collected $240 for a framed bulletin board to be placed outside the main doors of the temple for announcements, schedules of services and the like. Next week's collection will be announced later. Synopsis: The history of what Jesus did after His baptism is critical for us to understand. He set the example, both by accepting baptism and showing us what we MUST do after baptism. Let' look in detail at how to encounter temptation, which will surely come to us. We must be ready. I am writing this letter on Tuesday, two days before Theophany, and a day before I visit the Michael Unit, two weeks after Innocent and John were baptized. God willing, I will see the newly illumined Vladimir in the Hughes unit next week. This is a season of baptisms. On Theophany, I will baptize four, including a married couple who are converting together, and two children. Normally, I serve two extensive services the eve of Theophany, but I received permission from Bishop Peter to serve the morning service a day early (today), because I thought it was really important to see the newly illumined Christians as soon after their baptism as possible. Tomorrow will be a big day. To the Michael unit at 7:30AM, then back home for the Theophany Vigil, and then on the day of Theophany (Thursday), two baptisms, the Liturgy and blessing of the waters, a meal, then the baptism of the two children. I scheduled them separately because sometimes baptism of older children can be difficult because they get scared. I did not want to be in a time crunch. I have received permission to bring in all the stuff I need to serve Divine Liturgy. I though this would take longer, and I do not yet have a singer for the liturgy, but I am working on it. I plan to serve liturgy once a month in each unit, with a sermon and everything, and to have teaching the other time. I want you to know and love the services as much as I do. All our theology is plain for all to see in our services. I want you to know a lot of stuff about Theophany. It was actually more highly feasted in the early church than Christmas, for good reason. As is usual, I will draw on the archives of homilies and teaching I have written, because I just do not have the time and inspiration to write stuff all the time. Today we celebrate a day that is called by many names: the Baptism of our Lord, Theophany, and it is also called “Illumining”. We commemorate our Lord's baptism today in the Jordan. Theophany is the appearance of God, where indeed the Holy Trinity manifested Himself after Our Lord's baptism. Why would we call it Illumining? It is because through baptism we are indeed illuminated. God had a plan for man. The primeval plan was for us to grow in knowledge and in wisdom, according to how we could bear it, in purity, without any knowledge of evil at all. But man didn't choose that plan. So God, in His wisdom knowing this, sent his only-begotten Son. Salvation is the knowledge of God, but only the pure can know the pure. We can even see this in our daily lives. There are people whom we just don't completely understand, and we know this because we understand that they're somehow more pure and more humble than us. And we think: "I don't understand how that person can take such abuse from her husband, or his son, or his co-worker, or some other person, and be so humble about it." We know people like that. Hopefully there are people that speak about us in those kind of tones, because we are supposed to be a light to the rest of the world. Only the pure can know the pure. But we're dirty, and we need purification. And what's more, we don't have any way to become pure. We don't have any way to clean ourselves. And our flesh, what is more, wars against us. Even if we wished to clean ourselves, (and we don't have the means, without God's help, mind you), we cannot. We don't have the strength, the ability, we don't have the knowledge, we don't have the grace. We cannot understand God without Him revealing himself to us. So, that is why our Lord and Savior Jesus Christ came incarnate of a Virgin, into the midst of us – to invigorate us and make us able to live, but not only that; also to give us an example. His ministry was two-fold. Being God, He taught us all the things that were necessary for our salvation, by His example, by how He lived, by how He spoke, by His demeanor. And He transmitted this faithfully and carefully to his disciples. And this is only to be found – this mind of Christ is only to be found – in the Orthodox faith, and it has been transmitted carefully and perfectly, throughout the ages, by the Church. He showed us not only by His teaching, but also by how He lived. And He was a man, as well as being God, so He was subject to the things we are subject to, even unto death. So therefore, when He told us to be baptized, later on, after His resurrection, his words certainly have weight, because He subjected himself to baptism. He was not the kind of leader, or the kind of king, who would tell his subjects to do something that He wasn't willing to do. In fact, he said to James and John, that you cannot drink the cup that I will drink and be baptized with the baptism I will be baptized with. They could not bear what our Lord bore for us. He will do more for us than He requires of us and expect more of Himself. And indeed, that is a principle of leadership. A leader, whether he be a father, a mother, or a priest, or an employer, or someone who teaches children, such as many of the men in this church, must lead by example. All the men in this church should be teachers of our boys, and all of the women, of our girls, and you teach them by being selfless, and emptying yourself as Christ emptied Himself. He taught us how to do it, and gave us the blueprint of how to do it. Today we have an amazing thing before us. He who created the waters submits to being baptized in them. He who created the heavens and the earth and saw that it was good and not any whit evil, submits to cleansing in waters. He Who is the Regenerator regenerates our flesh, He descends in the flesh into regenerating waters. And he does this to show us how necessary it is for baptism. To know Christ we must be like Him. You cannot know somebody unless you become like that person – it is not possible. So our Christian life in the flesh is to try to acquire the virtues, to be a good husbandman, to acquire the Holy Spirit, as my patron, St. Seraphim of Sarov, said, "By fasting, by diligence, by care, by prayers, by weeping, by repentance, by the whole Christian life." That is the whole reason for ascetical exercises. It's not because they're rules to be followed. It's because they are LIFE! A man who sees a way of life that leads to eternal life, would be crazy, blind, not to follow such a life. So our Lord taught us many principles of how to life, but the most important aspect of His ministry is that He made us ABLE to live this way. I can tell you many things about the teaching of the Church, but I cannot invigorate you or make you able to live this way. That is only possible through your submission to the God-man Jesus Christ and the All-Holy Holy Trinity, Who makes a man able to live. So the God-man, when He preached, preached with authority, because He was able to back up his words like nobody else can. Baptism is an image; it's an image of death and of life. The church says it over and over and over again. When we descend into the waters, we die. Our old man, with its lusts, dies in the waters. When we ascend out of the waters, we are reborn a new creature. This is a hard thing to understand. We cannot fathom it. We do not know how a man is reborn of water and the Spirit, we just know how we are told to begin the Christian life. Baptism is the first mystery, although perhaps one would say the first mystery is really the incarnation of the Son of God, which made everything else possible. In our life, our entrance into the Christian life is through baptism. Without it, we're not able to progress one wit in the knowledge of God. And the knowledge of God IS salvation, brothers and sisters. But remember, one cannot progress in the knowledge of God without progressing in purity at the same time. We have no "armchair theologians" in the Orthodox Church. He who is a theologian – who studies God – lives as God wishes him to live, and is enlightened. We have had theologians that have not been able to read or write. Or even, and this is hard for us in our industrialized society to understand, they might not even have been intelligent, as we would think of intelligence. But they were intelligent in the ways of God, because they lived a life in accordance with His grace. I hope you understand now why our Lord was baptized. There was no NEED for Him to be baptized. In fact, what does it say after He was baptized? "Straightway He came up out of the water." To the fathers this is crystal clear, and therefore to us it will be now, too. He came straightway out of the water because He has no sin. In those days St. John was baptizing for repentance, a baptism of repentance, but not for remission of sins, because he cannot remit sins. People would, when they came out of the water – (and how would you like this, some of you have been baptized in streams that are cold!) – they were held in the water. They came up partway, and they confessed their sins right then and there. And then they were released out of the water. That's how it was done. But our Lord had no need to do so, He had no sins to confess. In fact, when He went into the water, the demons fled. You see the icon? You see the demons in there? The demons are fleeing from the water, because they could not bear to be in the same place as the God-man Jesus Christ. How can anyone stand against this mystery when our Lord endorses it so emphatically?! And also, if we have an understanding of how water was treated, throughout the whole history of the Church – now I mean the history of the Church from Adam, you know, because God had a salvific plan from that time. There is a cute bumper sticker, but it's not true: "Founded AD 33, Christian Church." It was reborn, and recreated in AD 33, but the plan had been in place since Adam and Eve. Let's take a look, a little bit, at these short scriptures we read today. "Then cometh Jesus from Galilee to Jordan unto John to be baptized of him. But John forbade Him, saying "I have need to be baptized of Thee, and comest thou to me?" And Jesus said unto him, "suffer it to be so now, for thus it becometh us to fulfill all righteousness." It was also tradition, a strong tradition, a God inspired tradition, of the Jewish people, that when a prophet said something, you did it! Jesus obeyed a prophet. John was the greatest of the prophets; our Lord Himself said so. So He obeyed a prophet, by being baptized. John did not mean for the God-man to be baptized, and he wanted to tell him, "No, I can't. I am unworthy. I want to be baptized of you." He therefore was obedient showed us an example, and later, after His resurrection a command to be baptized. Our Lord does not tell us to do anything we are not capable of doing. He does not tell us to do anything in the flesh that we cannot do in the flesh, and that he did not already do in the flesh. He told us that our flesh should become pure. His flesh was always pure; he made his flesh completely invigorated with the Godhead. And indeed, that will happen to us, because He did it to Himself. He promises us that we will rise from the dead. Well, he did it to Himself, so we are capable. He commands us to be baptized; He did it himself. He turned the other cheek when he was slapped by the arrogant Pharisees and by their henchman, the Roman soldiers. And He commands us to turn our cheek when we are slapped. He commands us to forgive, and He forgave. There is nothing, there is no commandment that the Lord gave that He did not fulfill Himself in the flesh. And He even told us to be perfect, and He was perfect – in the flesh and as God. So all those things we are capable to doing because He did them for us and made us able to. He led by example, and He led by power and grace and mercy. "Then He suffered him. And Jesus, when He was baptized went up straightway out of the waters and lo! The heavens were opened unto Him, and He saw the Spirit of God descending like a dove and lighting upon Him. And a voice from heaven saying "This is my beloved Son in whom I am well-pleased." We already said what it means that He went "straightway out of the water." John was in the water trembling, as a man before God. And God comes out of the water, and the Holy Spirit descends upon His shoulder, Jesus' shoulder, so as not to confuse the two. And the voice says, "This is my son, in whom I am well-pleased." And the heavens are opened. Why? This is because the heavens are opened to us through baptism. And also the heavens are opened to us through something else. Right away after the baptism, St. Mark barely catches his breath, I don't think he even has to dip his pen again in ink, and he starts to write, "and straightway He was led out by the Spirit into the wilderness for 40 days." There is a reason why he writes with such haste, why he doesn't even finish talking about baptism and wham! He is talking about Jesus being tempted in the wilderness, because this happens to us. Right after our baptism we are tempted. During the whole of our life we're tempted, and sometimes we feel that we are in a barren place, a rocky dessert, with no water and no comfort, and we get despondent. Our Lord had the same things happen to Him; He became hungry as a man, tired as a man, He wept as a man. And right after His baptism He shows that we should expect that we are in a life or death struggle. Immediately upon being baptized we are enlisted as soldiers. Not as conscripts, mind you, but as willing men, willing to put on the armor of faith and of righteousness. We are willing to fight the good fight, because we have stated so, whether it was as an infant when our sponsors stated for us and we grew to maturity and we learned of the church, or whether it is, in the case of most of us, where we spoke for ourselves and agreed to the tenets of the Christian faith before we were thrust down into the water and out of it three times. The Church today, (and yesterday by the way), blesses water. This is called the great blessing, and in it we read amazing passages from the Old Testament about water and its salvific qualities. And then we take this water and we sanctify everything with it. And you should listen closely to the services – especially I can remember some things from last night – they talk about how our Lord cleanses the water, casting out demons from it, and making it pure and wholesome. It is good – to drink, to anoint ourselves with, good to bless and sanctify everything. And we indeed bless and sanctify water because our Lord blessed and sanctified water. I am always amazed – even after 18 years, how our faith involves all of our life – everything! All of our senses – sight, smell, hearing, touch, taste – everything! And every aspect of our life – nothing is untouched by the holy church. In a pious Christian life, nothing is secular, but everything is sacred. So after we bless the water today, and bless the inside of the church, and go around and bless the outside precincts, you will take water home. You should drink this water in the morning, with the sign of the cross, and also eat a small piece of antidoron, before you eat or drink anything else. And you should also drink this water if there is a temptation or a difficulty in your life. You should anoint yourself with the water. You should sanctify things in your home. I have had the custom of going around all the rooms of my house with a censer, with all the rest of the family carrying candles and singing the Theophany Troparion, to bless everything with holy water on a regular basis. I do not do it as much anymore – I guess I am more distracted and busy than I should be – but this is an important task. Anyone can do this. The demons see the water, even after the water dries on the walls and you cannot see it, (except if you have sprinkled it on paper, the marks never go away then), the demons still see it, and you have marked your house as a dwelling of Christians. But of course, if you do this, then you must live as a Christian. What happened to the man who had the demons taken out of him, and the demon went around deserts and rocky places, and desolate areas, and the found no place to dwell? What did the demon do? He got seven other demons worse than himself, and he went back to the man. They found his soul was all swept and garnished inside, but since the man had not lived a virtuous life since his deliverance from the one demon, and the demons were able to make their abode in him, and the last state of the man is worse than the first! There is responsibility placed upon you, brothers and sisters, because of the grace you have been given – because of your baptism. Also because of the All-Holy mysteries which all of you should desire to receive today, and the services of the church, and all the mind of the church. Everything that you do is sacred, and it makes you responsible, for living according to how you have promised to live. The good news is that you are ABLE to do it, because the God-man made you able to do it! God revealed Himself, and continues to reveal Himself to us, as we are able to understand Him. As we become more pure, He reveals more of His purity to us. And we ascend like eagles! That is the meaning of Theophany. That is the meaning of the illumining. May it be that all of are illumined and follow Him in all ways. Amen. What is there to wash away in Thee, Who art more pure than the sun; or to enlighten in Thee, the Sun of Righteousness? — But is it for us sinful and short-sighted ones, deprived of far-sightedness, to gainsay the Lord Himself, Who created all things and Who wisely does much that is beyond word and reason? All the words spoken by the Lord Jesus Christ, and all His actions, bear within themselves the seal of the supreme wisdom and righteousness of God, so incomprehensible to the proud scholars of this age, who dare to equate the Very Lord of Glory Himself to ordinary men, and who interpret His words in accordance with the understanding of their perverted and lost minds; — and we must humbly bow ourselves down before Him with perfect trust and with profound reflection, beseeching the gift of understanding from God. Hence, the aforesaid words of the Lord to John that he baptize Him silently, and without gainsaying Him, — and the very act of baptism at John's hand — likewise bear upon themselves the seal of the most-supreme wisdom, goodness, and righteousness of God. Let it be, for now, says the Lord, for thus doth it behoove us to fulfill all righteousness; i.e., it is for this reason that I came to earth and became man, while abiding ever as God, — the Lord says, as it were — in order to fulfill all Divine righteousness, which was so brazenly trampled down in paradise by the first-created humans and, later, — the further one penetrates into the depths of time and of the generations of man — even more audaciously, more wickedly, more evilly, more profanely, was trampled down by all mankind, with the exception of a few chosen ones. Generally speaking, in the course of reading or hearing the Lord's words, or His gospel concerning His acts, we must not let it slip from our purview that He is the Lamb of God, Who taketh upon Himself the sins of all the world, and the Redeemer of the human race; the High Priest after the Order of Melchisedec, Who offered Himself as a Sacrifice of reconciliation to His Father in Heaven, on behalf of us sinners, — that He is the Righteous Judge of all, the Physician of all those languishing in sin, and the Warrior Who has gone out to engage in spiritual single-combat that spiritual Goliath — the devil — who, with supreme artifice, cunning and perseverance, did subjugate, and continues to subjugate, the entire human race by means of innumerable passions and vileness of all sorts, and whom the Lord, through divinely-wise, righteous forethought, has vanquished completely, delivering mankind from his [the devil's] power. Baptism was ordained by God in the Church for the salvation of the human race, — and it is necessary for every believer as a door into the Kingdom of God, — and whosoever rejected or rejects it, the same sweeps away his salvation, his own eternal well-being. In this manner did the Lord speak of the Pharisees and the Scribes, who were undesirous of being baptized by John; that they were thus spurning the Counsel of God, concerning themselves, in not being baptized by him. Beloved brothers and sisters! We all have been found worthy of holy Baptism in our infancy, through the faith of our parents and our sponsors; we were cleansed of the ancestral sin and were reborn of water and the Holy Spirit, and — became the adopted children of the Father in Heaven. Let us, then, with all our hearts, always esteem the Divine gift and our calling as sons and daughters of God by grace, — withdrawing far from all sin, and let us, in our thoughts, desires, and actions, strive for the Kingdom of Heaven, that inccorruptible, unfading inheritance, prepared for us in the heavens. On Theophany, that is, the Day of the Lord's Baptism, every year a great miracle is performed. The Holy Spirit, coming down upon the water, changes its natural properties. It becomes incorrupt, that is it does not spoil, remains transparent and fresh for many years, receives the grace to heal illnesses, to drive away demons and every evil power, to preserve people and their dwellings from every danger, to sanctify various objects whether for church or home use. Therefore Orthodox Christians with reverence drink Holy Water – a great Agiasma (holy thing), as the Greeks call it. One should always have at home enough Theophany water so that it will last the whole year, and make use of it at every need; in cases of illness, leaving on a journey, whenever one is upset, students when going to examinations. They do well who daily, before eating any kind of food, drink a little Holy Water. It strengthens the powers of our soul – if it is done, of course, with prayer and reverence, and one does not merely expect from it a mechanical result. Every priest should take care to bless a sufficient quantity of water for his church, so that it will be on hand for the course of the whole year for every need and to be given out to those who ask for it; and parishioners should provide for themselves at Theophany with Holy Water for the whole year and even so that it can be kept for future years. Questions and Answers about Theophany. When is Theophany celebrated? What does it commemorate? What is another name for this feast? The feast of Theophany is Jan 6 (Jan 19 on the civil calendar). It commemorates the baptism of the Lord Jesus Christ, and much more, as its name implies. The word "Theophany" means a "manifestation of God". This is similar to another word by which this feast is known, "Epiphany", which just means "manifestation. We celebrate the baptism of Jesus Christ as a Theophany because the Holy Trinity was made manifest after His baptism (when He came out of the water). Retell the story of the baptism of Christ. Which Evangelists report it? All four Evangelists report the baptism of Christ, and its precursor, the preaching and baptizing of the Holy Prophet and Forerunner and Baptist John. The actual event of the baptism of our Lord is reported very laconically in St John's gospel, and is only alluded to. The story is actually very simple. The Holy Prophet and Forerunner and Baptist John was preaching repentance and baptizing in the Jordan. His ministry was preparing the hearts of the people for Christ. Jesus came upon him one day and asked to be baptized. The Holy Prophet was filled with fear and in humility told that Lord that it was he that needed to be baptized, and not Jesus. Jesus told John to "suffer it to be so now, to fulfill all righteousness." The Lord was then baptized (immersed) in the waters of the Jordan, and upon coming out of the water, He saw the "heavens opened", and a voice was heard from heaven, which said, "Thou art my beloved Son, in Whom I am well pleased", and a dove descended upon Him. Jesus has no need for the baptism of John, which was a baptism of repentance. (Matthew 3:11, and elsewhere). Neither did he have need for Christian baptism, which is the renewal of man and the making of a new creature. The God-man is totally sinless, and in no need of renewal. Our Lord was baptized as an example for us, to point out the necessity of baptism for man. There is no requirement that He has made for us that He did not fulfill Himself, including baptism. He did everything as a man that He requires of us, as men. He who endured smiting and spitting, and torment for our salvation demands of us that we turn the other cheek when we are smitten by our enemy. He Who prayed with fervor in the depth of the night demands of us that we pray without ceasing. He Who brought all things before His Father, and even the horrible specter of His impending death demands us to ask concerning all our needs. He Who submitted in all things to His Father demands of us that we pray, "Thy will be done" concerning all things in our life. He Who submitted Himself to baptism demands of us that we be born again, of water and the spirit. What happened immediately after the Lord's baptism? What can we infer from this? Where did the Lord go after His baptism? What happened? What may we infer from this? Another significant event happened while the Lord was away. What was it? Why did St John the Baptist baptize? What major event in Israel points to baptism? Are there others? The passage of the children of Israel through the Red Sea is a type of baptism. The Angel in the Furnace. The Three Angels who met Abraham. Moses seeing the "back parts" of God. Elias in the cave and the "still small voice". The pastor visits the homes of all his parishioners and the days shortly following. Why? How should one make ready for this visit? It is a long-standing tradition in Holy Orthodoxy that the homes of all the faithful be blessed yearly, after the blessed feast of Theophany. The power of water to sanctify and transform is amply demonstrated in baptism, and we believe that God chooses to bless us through holy objects and actions, such as the relics of those who have pleased God, holy icons, oil and water. The priest usually prays a short service of supplication and then blessed all living areas of the house with water, while singing the troparion for Theophany. In this way, the home of a Christian is "marked" and sanctified. When the priest arrives, the home should be very clean, and picked up. The doors to all rooms except the bathrooms should be open. It is good to have a small table set up, with a cloth on it, and a candle. If the family has an icon of the Theophany, it can be placed there, along with any other icons that are well loved in the family. The best place to put this table is before the family's icon corner. What is the fasting typicon for every day from Nativity up to and including Theophany? The Nativity of the Savior is such a joyous feast that all foods are allowed on the day of the feast and all days following, until the day before Theophany, which is a strict fast (if this day is Saturday or Sunday, wine and oil are allowed). On Theophany itself, of course, all foods are allowed. Royal Hours of Theophany. Troparion of the pre-festival – Tone 4. Whereby we cross the flowing stream of life. Christ hath appeared in the Jordan to sanctify the waters. This troparion is sung at each of the Royal Hours of Theophany. It describes an event which is a “type” or foreshadowing of baptism. Many Theophany hymns describe the many types of baptism in the Old Testament. A “type” is an event or thing which foreshadows or “points to” a future event or thing. A good rule of thumb regarding typology is that the more types there are for a given thing, the more important it is. There are many types for baptism, the cross and the resurrection, for example. The dividing of the River Jordan when it was struck by the mantle of Elisha is an obvious type of baptism, since it evokes the memory of the dividing of the Red sea, which is perhaps the quintessential and most important type of baptism in the Old Testament. This event has a nuance to it that the dividing of the Red Sea does not have. We know that when Christ was baptized in the same Jordan waters that were divided by Elisha’s mantle, “the Jordan turned back and fled” from the God man Jesus Christ. Here is the moral connection that I talk so often about. Our Lord’s baptism “sanctified the waters’, that is, changed the nature of water so that the waters of baptism can enable our nature to live victoriously, and to become perfected. Whatever happens to us — with baptism, we will be able to “cross the flowing stream of life” and find perfect rest. Baptism is not just an event. It is active throughout all of our “flowing stream of life”. As in the parting of the Red Sea, the parting of the Jordan indicates for us that baptism is active in the beginning of our new life, in the middle (as we cross the flowing stream of life) and at the end, when we reach the other side. The waters are a wall of protection and also of guidance. moral implications of baptism. The God-man Jesus Christ made our humanity capable of perfection, so that we could know perfection – God, and in baptism He provided the means of this change. The beginning of the Gospel of Jesus Christ and baptism, and the end, where we will have fought the good fight and finished the course. Readings for the Sunday before Theophany explained. Synopsis: The Sunday before Theophany (the baptism of Jesus Christ), we read from Mark about the "beginning of the Gospel of Jesus Christ" and about the baptism of John, which is a vivid type of Christian Baptism. The entire selection, form Mark 1:1-8 us explained, and especially how John's baptism (of repentance) is different (and the same) as Christian baptism. It is also appropriate on this day to think about the eventual fruit of baptism, which is human perfection and union with God, and the passage of 2Timothy 4:5-8 presents us with a beautiful "after" picture. This is our destiny, if we accept baptism and work to attain it. Mark 1:1-8 1 The beginning of the gospel of Jesus Christ, the Son of God; 2 As it is written in the prophets, Behold, I send my messenger before thy face, which shall prepare thy way before thee. 3 The voice of one crying in the wilderness, Prepare ye the way of the Lord, make his paths straight. 4 John did baptize in the wilderness, and preach the baptism of repentance for the remission of sins. 5 And there went out unto him all the land of Judaea, and they of Jerusalem, and were all baptized of him in the river of Jordan, confessing their sins. 6 And John was clothed with camel's hair, and with a girdle of a skin about his loins; and he did eat locusts and wild honey; 7 And preached, saying, There cometh one mightier than I after me, the latchet of whose shoes I am not worthy to stoop down and unloose. 8 I indeed have baptized you with water: but he shall baptize you with the Holy Ghost. 2 Timothy 4:5-8 5 But watch thou in all things, endure afflictions, do the work of an evangelist, make full proof of thy ministry. 6 For I am now ready to be offered, and the time of my departure is at hand. 7 I have fought a good fight, I have finished my course, I have kept the faith: 8 Henceforth there is laid up for me a crown of righteousness, which the Lord, the righteous judge, shall give me at that day: and not to me only, but unto all them also that love his appearing. In addition to St. Seraphim of Sarov, we celebrated St. Juliana of Lazarevo, the patron of our sisterhood, today. St. Juliana is a very inspiring example of sanctity in the midst of the cares of everyday life. If you are not familiar with her life, read it! Oh, and remember to find it using "Goodsearch" instead of of Google; if you enter our church in the "charity" box, we get a small donation for every search you make! This week we celebrate the Feast of Theophany. In the words of one of the hymns that we sang on Saturday evening, we are now forsaking the land of Judea (where Christ was born) in order to hasten to the Jordan (where He was baptized). Let us all, then, hasten, for now our Lord, born secretly in a cave, is revealed to the world! Now His preaching begins! Now He calls us to repent and leads each of us, through baptism and renewed life, to the kingdom of heaven! Let us all embrace this feast, which is even greater than the last! Next weekend, North Texas Orthodox Missions is holding a missions and evangelism conference in Dallas and Fort Worth. You are encouraged to attend. This week, we collected $183 for the building fund of the St. Siloan Russian Orthodox Mission in Chile. Next week, we will collect for a Platytera icon of the Theotokos for our church. This icon, to be painted on the eastern wall above the altar (top center in this photo), is the first step in our long-term plan for the iconography in our temple. Monday and Tuesday are fast free. Eat your favorite foods, and give thanks to God! Wednesday, the eve of Theophany, is a strict fast day. On Friday, we fast as usual. Services were Nativity were beautiful and well attended. Thank you to everyone who participated! As Father Seraphim said in both of his homilies this weekend, may your encounter with our Incarnate God truly change you and bring you closer to Him and to eternal life in Him! This week, we collected $73 for the rebuilding of the Valea Screzii orphanage in Romania, which was devastated by fire on December 26th. Next week, we will collect for the building fund of the St. Siloan Russian Orthodox Mission in Chile. The period from Nativity until Theophany is fast free. Eat your favorite foods, and give thanks to God! We worship Thy Nativity, O Christ, Show us also Thy divine Theophany Nativity of Jesus Christ, Eve of Nativity. Text/Audio. Today, brothers and sisters, on this pre‑feast of Nativity, we hear so much about the humility and the lowliness of Christ. Many things that are not befitting of a king are happening. He is poor. He is born of a woman that is not even married; this is a scandal to society. He is born in a cave, in a manger, a cold manger because it was winter. And kings come to Him, later on, not on the day of His birth, a little bit later when they were in the house, to worship Him. They worshipped a poor Man in a poor little house. Usually when a king's son is born, it is heralded over the entire country. And only a few shepherds heard. So many things that are contradictions about the way the world treats its kings, happened to our Lord. I think that's all for our purpose. That is to show us the way to live. Of course, our Lord gave us an example how to live, and He fulfilled that example. That was an essential purpose of the Incarnation. We can't say it was only to forgive sin. It was also, and more importantly, so that we could obliterate sin so that sin could be cast out from us. The way for that to happen is for us to be told the way and shown it, by example, and for us to be given the ability to follow the way. And that is what we celebrate in the Incarnation, in the Nativity of the Lord. Now, we just read from St. Luke's account about the Nativity that Mary kept all these things conjecturing them in her heart. We should follow that example. That's very, very important. That is what the services really do. All of our services are this conjecturing in our heart, this thinking about holy things and rephrasing the dogmas of our faith in ways that touch us. If you listen to the services carefully, you will see things or hear things every day that are striking to you, that are amazing to you, that cut you to the core. And you should conjecture on them in your heart. One cannot think too much about the Incarnation or about the Resurrection or about the humility of our Lord or about the coming of the Holy Spirit or about any dogma or any truth or any teaching that is in all of the Scriptures, whether it be in the Gospel or the epistles or anywhere else. I know a story of a monk that had left and gone out into the wilderness because he heard the first portion of the first Psalm, and he meditated upon that and tried to live according to that for his entire life. And that's enough if we conjecture even such a small part of a Psalm in our heart. "We worship Thy Nativity, O, Christ. We worship Thy Nativity, O Christ. Show us also Thy divine Theophany." Now, Nativity and Theophany have always been connected historically. There was a time when they were a single feast. Now they are disconnected by twelve days, but they are still connected in our liturgy. They are still connected in our hymnology. 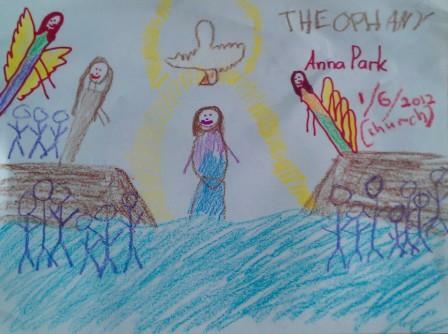 So this is certainly a reference to the Theophany about to occur. We have another name for it, Epiphany or the Baptism of Christ. Theophany and Epiphany basically mean about the same thing. They are a manifestation of God to man. And there have been many Theophanies such as when the holy children saw the Angel of the Lord in the furnace; that is none other than the pre‑incarnate Jesus Christ. Abraham gave hospitality to three Angels; one of them was the Angel of the Lord, the pre‑incarnate Jesus Christ. Moses was in the mountain and he said, "I want to see Thy face." The Lord says, "You can't see My face. No one can see My face and live." But He said, "I will show you My back parts. I will put you in the cleft of the rock." And when the glory of the Lord passed by, Moses was in the cleft of the rock. That was a Theophany of the pre‑incarnate Lord Jesus Christ. But now we don't have to have Theophanies of the pre‑incarnate Lord Jesus Christ because He has been born of the woman and He is now a Man, a perfected Man, as we should become. So when we are singing this, deeply in your heart, you should feel what the purpose of the Incarnation is for. It is so that we could see the divine Theophany. We're not talking about the feast coming up twelve days after Christmas. We're talking about the manifestation of God in the Psalm, because our purpose is to know God and know Him intimately. So this is why the Lord was born. This is why the Lord taught. This is why the Lord assembled twelve apostles and why He died on the Cross for us and why He resurrected and why He ascended into the Heavens and then sent the Holy Spirit to us. All of these things are for one purpose and one purpose only: So that we would know Him. We cannot know Him without becoming purified. So when we say, "We worship Thy Nativity, O Christ; show us also Thy divine Theophany," we are begging the Lord for help. We're being aware that the Lord has come so that we could be purified so that we could know Him. "To the pure all things are pure," the Scripture says. And also, "Blessed are the pure in heart for they shall see God." We cannot see God and know Him without becoming purified. But if you look in your own life, you will see there are a lot of things that are not pure and not good. The Lord came so that those things would become purified; the darkness would become light, and the coldness would become warmth. And the blindness would become all eye, all seeing, so that we would see the Lord as He is and not be afraid. This is what we are praying for: That the Lord would indwell in us, cleanse us of all sin, so that we would be in a perfected state; so that we could see Him and know Him as He is ‑‑ not as a pre‑incarnate Angel of the Lord, but as the God‑Man Jesus Christ, the eternal One, the Only Begotten of the Father, the Lord of Heaven and the earth ‑‑ and be in His presence and not be ashamed but be glad. This is what we are asking for. If you read this hymn or sing it ‑‑ it's better to sing it, of course, if you can, because it's much more beautiful; it's in the sixth tone ‑‑ it begins speaking about the contradictions. And as I said in the beginning, this is important because the things that the Lord did were all for example: The prophecies that were given, those that are His progenitors, their lives: Are examples. Everything about Him is an example about how we should live. The King of all, the Creator of the universe, humbled Himself to become a poor Man. So we should humble ourselves. It doesn't matter if we are poor in terms of monetary wealth or not, but we must be poor in spirit or else we can't know God. So here is what this hymn says. "Today He Who in essence is God intangible and holdeth all creation in His hand is born of the Virgin and wrapped as a mortal in swaddling bands. He lieth in a manger, Who established the Heavens by His Word in the beginning. He is fed at the breast with milk, Who rained down manna upon the people in the wilderness. The Bridegroom of the Church summoneth the magi; the Son of the Virgin receiveth their gifts. We worship Thy Nativity, O Christ. We worship Thy Nativity, O Christ. We worship Thy Nativity, O Christ. Show us also Thy divine Theophany." So let it be for us. Let us become as the God‑Man. So that we can have His Theophany shown to us, in us. Amen. You are currently browsing the Saint Nicholas Orthodox Church blog archives for January, 2012.